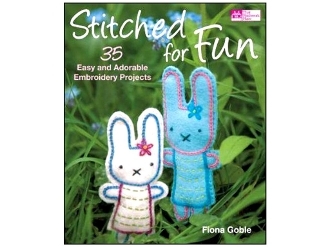 This fabulous collection of simple and fun motifs will inspire even a complete beginner to take up needle and thread. Each design is shown on a different object - whether it be a French cafe on an apron, cheerful weather clouds on canvas shoes, or a beaming moon on a lampshade - and is accompanied by straightforward instructions. Armed with basic sewing skills, the ideas in this book, and a little imagination, you can quickly transform plain textile objects into mini works of art. Be inspired to personalize cotton, felt and fleece and make unique gifts. Turn to the "Make Your Own" section for basic instructions on creating everything from place mats and aprons to cushions and bags. Gather exciting ideas for further use of each motif. 128 pages, soft cover.